There's only one ingredient in this coconut oil: 100% organic, cold-pressed, unrefined, virgin coconut oil. There's only one ingredient in othis coconut oil: 100% organic, cold-pressed, unrefined, virgin coconut oil. Coconut oil is an edible oil extracted from the meat of mature coconuts. This one is organic, cold-pressed, and great for everything from beauty to baking! 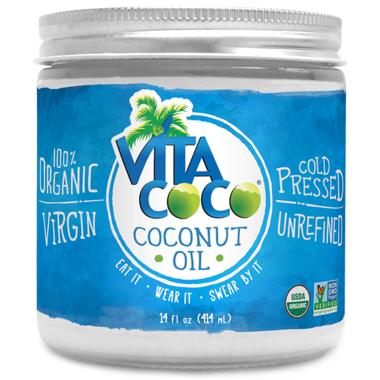 Ingredients: 100% organic, cold-pressed, unrefined, virgin coconut oil. This is by far the best coconut oil. I have tried many types. The texture is very smooth and my nails are sooooo shiny. It's like I have clear polish on and I am convinced it's this product. I use this coconut oil for my baby as a moisturizer and itâ€™s the best decision Iâ€™ve made. His skin is always smooth and hydrated after each use and the fact that itâ€™s 100% natural really puts me at ease. This is by far the best tasting Coconut oil on the market in my honest opinion. I actually use it in my coffee everyday.